This filterless air purifier quietly and effectively reduces up to 99% of allergens, odors, mold, mycotoxins, VOCs and germs. It uses NASA developed AHPCO technology and Bi-Polar ionization to breakdown pollutants on a molecular level. It measures 4" x 4" x 14" and weighs 6 lbs. 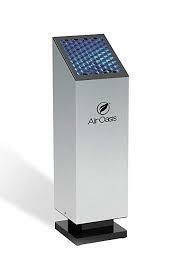 It purifies the air in rooms up to 1000 sq. ft. The original purchase price from Air Oasis and on Amazon is $399.99. There are no used units for sale on either Amazon or Ebay. The Handicap Foundation has tested this unit and will guarantee it for 30 days. For sale for the great price of $200. Email pjbarrett@aol.com to purchase.